It’s been awhile since I’ve shared a treasure post, and I wore one of my most precious treasures the other week, so I was inspired to write about it. This is my charm bracelet. It was a gift from my grandmother when I was young. She had two charm bracelets herself: one gold and one silver. I remember them as being loaded with charms and full of memories. My ambition is to create the same with my bracelet. Over the years, I’ve slowly added to it, always looking for opportunities to remember a special trip or a momentous occasion with a charm. Friends and family know that I collect charms, so they also give them to me every so often. 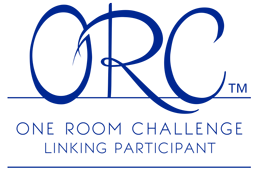 Every link now has one charm, and a few have two. I can tell you where each charm came from and who gave it to me. It started as a memory of my grandmother, but it has become so much more… so many people and places that have been special in my life. Just in case I ever forget–or on the off chance you’re curious what everything is–I’m including the list here. Bottom row left to right: teddy bear charm from my friend Catherine, bag piper from Halifax, Nova Scotia, green stone bear from Jasper National Park in Alberta, Hershey kiss from a visit to the Hershey factory during a family trip, heart locket (my very first charm given to me by my grandmother when she gave me the bracelet), goose from my mother, maple leaf from myself, thimble to symbolize my love of sewing, Cupid given to me by my grandmother one Valentine’s Day, coin from Matt’s and my trip to Cuba, good luck symbol from my friend Catherine’s trip to Mexico, 20th birthday (and the year 2000) charm from my aunt, amethyst from my Dad and sister from a school camping trip to Sudbury, knitting needles and a ball of wool to symbolize my love of knitting, green stone totem pole from Jasper National Park, round charm from my university, fairy from my friend Laurie. Along the top, there is a running shoe from my brother Adam to symbolize my love of running, a sapphire (my birthstone) from Matt, and interlinked hearts from my sister’s engagement party. Over the weekend, I picked up a new charm to add to the bracelet. 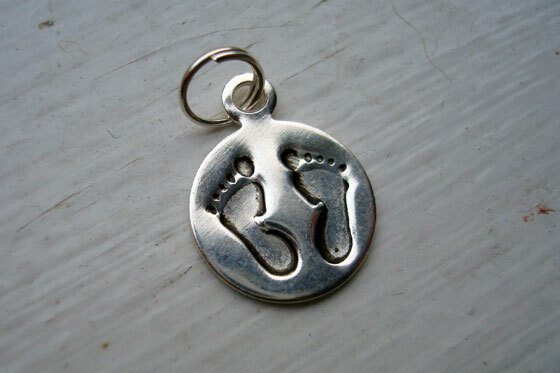 At my sister’s baby shower, her mother-in-law had charms of baby footprints. I think this will be a great memento of my newest niece or nephew. This baby will be the first grandchild on my side of the family, so it’s definitely a momentous occasion. Anyone else have a charm bracelet? Do you collect mementos? 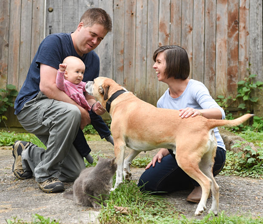 How do you remember special times in your life? I have a very similar charm bracelet. My mom gave me her’s from when she was young. I took a few of her charms off because I didn’t want to accidentally lose one. And I have added several of my own. One of my favorites is a really tiny spark plug charm that mom got me because I have sold auto parts my whole life. 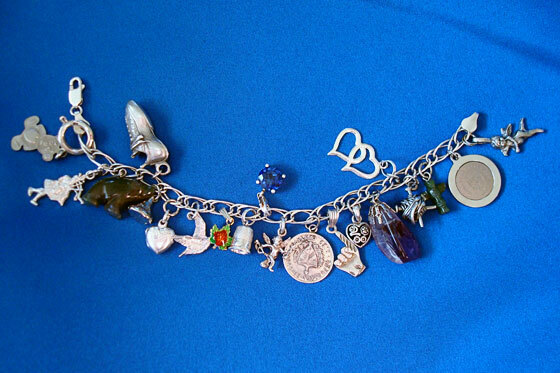 A few years back when they started coming out with new style charm bracelets with barrel charms or square charms I was so happy that I still had a more traditional charm bracelet. The only reason I am nervous to wear it is that I am always afraid I am going to catch it on something and lose a charm. I love the idea of a spark plug charm. Something “rough” in the delicate form of jewelry is a really neat contrast. I’ve never gotten on board with the barrel or square charms either. I guess I’m too traditional. 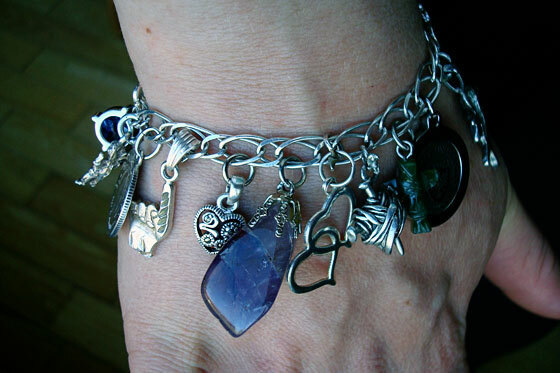 I’ve fortunately lost only one charm over all of the time I’ve had the bracelet. I still feel bad that I lost it. Oh, I couldn’t do that. I don’t want to spoil the ending! Even magazines I read page by page, front to back. And see, sometimes you get the wrong idea by skipping ahead! This is so lovely!!! I have always loved charm bracelets and yours is beautiful! Your charm bracelet is wonderful! I have one too, and I love it. It’s been sitting in my jewellery box for too long, and you’ve inspired me to get it out and wear it, and start collecting again. I don’t know why I stopped. I think it would be a great symbol of getting back to myself, something I’ve really been doing lately. Wonderful! Your bracelet sounds as meaningful to you as mine is to me. I think it is. Lots of memories! Very charming! Sorry couldn’t resist. It is great how sometimes the smallest thing can be the start of a wonderful story. I love your bracelet! I have only recently started collecting charms from vacations or special events etc. At the moment I only have a dolphin, anchor and boat wheel I got from Hawaii to remind me of the highlights of my holiday. I went to see dolphins, visited Pearl Harbor and saw the Battleship Missouri, so I thought the 3 charms were a good representation of my holiday. I think it’s a great idea to add charms other than silver, like your amethyst and coin. Is your charm bracelet something you wear everyday, or just on special occasions? Those are great charms and great memories. It’s really special to build it over time and then look back at the special moments. I definitely don’t wear my bracelet everyday, but I don’t save it just for special occasions. I’ll wear it to work every so often, but I always wear it on my right wrist and it jangles quite a lot as I write and use the mouse! It doesn’t bother me, but I worry about the sound annoying other people. It’s too special though just to keep in the drawer.